Served with boiled fingerling potatoes and Asian Cabbage and Fennel Salad. One of the few benefits of living in an area where terms like “polar vortex” and “snow-mageddon” are bandied about is that you have the right, nay, the duty, to pull out the crockpot or dutch oven and put something yummy in it. (Nerdy Game of Thrones warning ahead) Seriously, it’s so cold right now, all I want to do is curl up by my squid-themed fireplace, grab my adorable direwolf puppy, and eat something delicious. Unfortunately I don’t have a fireplace, squid-themed or regular, and my direwolf hates the cold even more than I do. But I can definitely manage the delicious part. 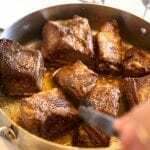 Short ribs are great because they’re not terribly expensive, taste amazing and are incredibly easy. The only things you need to remember are to use the right cut for the recipe you’re making and leave yourself enough time to cook them low and slow. In fact, I’m a huge fan of making them a day ahead. They actually taste better when they’re reheated, plus it’s so much easier to de-fat the sauce when it’s cold. Win-win. The only problem with making them in advance is that on the day you cook them, your house will smell like delicious short ribs that you will have to wait to devour. Lose-lose! Ginger, garlic, beer, vinegar and hoisin. Check! Sear the ribs really well before you braise. Pop them in a slow-cooker or dutch oven. (Note: you can either use a slow-cooker or a dutch oven for this. Both work well). Season the ribs generously with salt and pepper. Heat the vegetable oil in a large heavy pan over high heat (do this step in the dutch oven if you’re not using a slow-cooker). Brown the ribs well on all sides, in batches if necessary. Remove the ribs and pour off all but a tablespoon of the rendered fat. Return the pot to the stove, lower the heat to medium-low and saute the garlic and ginger for about 3 minutes. Be careful it doesn’t burn. Add one of the beers and the vinegar and scrape the bottom of the pan to deglaze any brown bits. Add the ribs to the slow-cooker (or back to the liquid in the dutch oven). Pour the beer and vinegar over the ribs. The ribs should be about ¾ of the way submerged in the liquid. If they’re too exposed, add some more beer (or use beef stock or water). 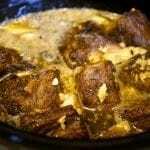 Cook on the high setting in the slow-cooker or gently simmer in the covered dutch oven for 2½ hours. Pour the hoisin sauce over the ribs, stir and cook, uncovered, for 30 more minutes. 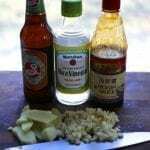 Remove ginger from sauce. If you're serving right away, strain fat from the top of the pot (or use a gravy separator). If you're refrigerating overnight, skim the fat off when it's cold. If you want the sauce to be thicker, make a corn starch slurry (2 teaspoons corn starch stirred into 1 tablespoon cold water). Stir the slurry into the simmering sauce a little at a time until you like the thickness. 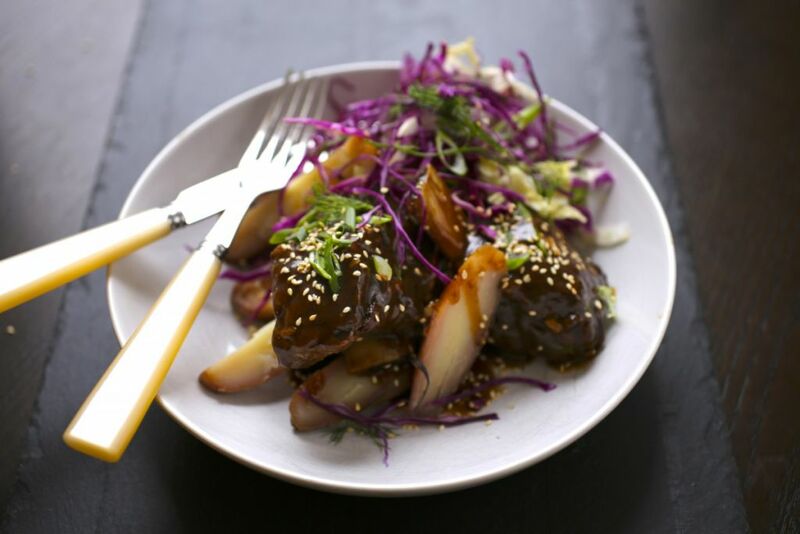 Serve with rice, mashed or boiled potatoes, and Asian Cabbage Salad. 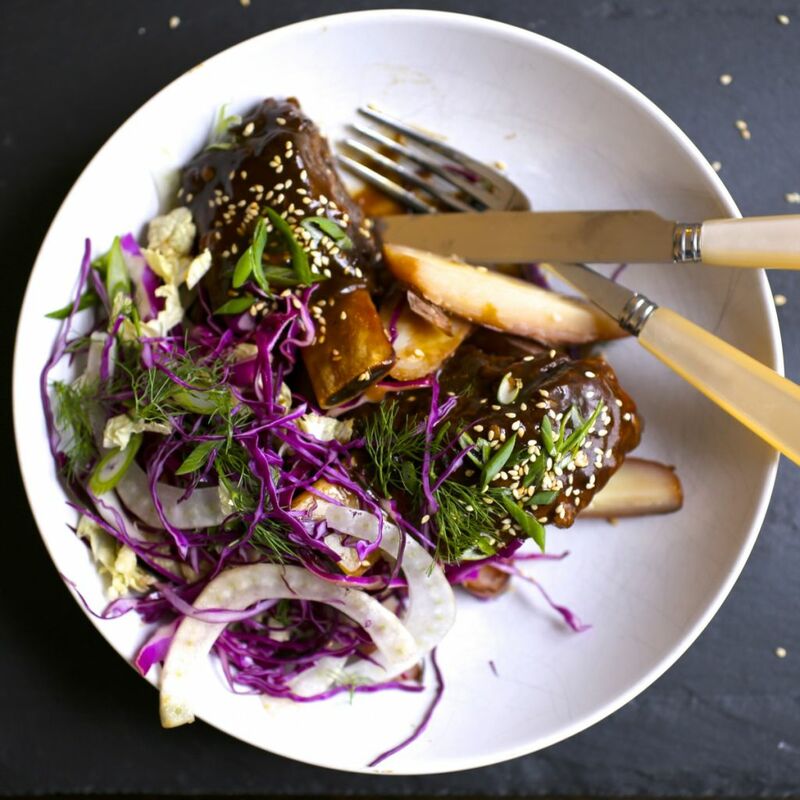 Don’t forget to use English-Cut ribs (usually rectangular with the meat on top of the bone). A slow-cooker or a good, heavy-bottomed dutch oven are pretty much needed for long braising. Are you serving them the day you make them? Using a fat separator (like for thanksgiving gravy) will make it easier to get a grease-free sauce. These will shrink a lot so make enough for leftovers! Reheat in a low oven (300F) for 20 minutes or so, or gently simmer on the stovetop, stirring often until warmed through. These look delish.. but I am not old enough to purchase the beer. can you guys buy it for me? I thought these might be too “moist” for you! Thanks guys I have made this recipe twice now with little variations and it has become a family favourite!!! I have added a little 5 spice powder and sauté d the ribs in a little blood orange olive oil and wow!! !